Justin Boots is a footwear brand founded in 1879 by H. J. Justin when he moved from Indiana to Texas. 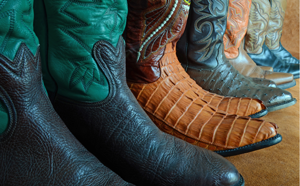 The company has expanded since then and is now owned by Warren Buffet's Berkshire Hathaway, but it still specializes in cowboy boots. Justin & Friends, June 12, 2011" by Woody Hibbard. 2014 ""Heritage."" Berkshire Hathaway. http://www.justinboots.com/heritage, accessed July 9, 2014."